You are invited to the first ever COB Awards and Appreciation Banquet to honor exemplary students, faculty and alumni on April 13, 2015. 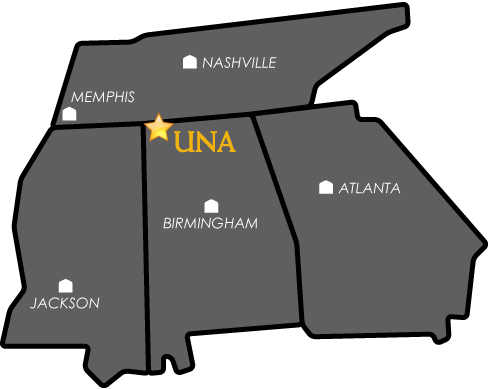 Also, Mr. Joel Anderson will be presented an honorary BBA degree from UNA. We are proud to have so many talented people within the COB, and donors who support the department’s initiatives, specifically study abroad programs. SunTrust Bank has been a key supporter of these programs, underwriting $10,000 in scholarship funding to enable Business students to study abroad. Additionally, the banquet will present a slide show and information about various study abroad opportunities. Mr. L.O. Bishop has covered a significant portion of the meal cost, allowing most of the proceeds to go directly to support students. The awards banquet will be held on April 13, at the Guillot Center from 5:30 until 7:30. Please contact Cheryl Williams at 256-764-4261 for more information.